Let me begin by saying a big thank you. It was perfect. Almost surreal with those lights and the whole look. Yes, we enjoyed a lot and will definitely recommend to all our friends and family to at least try you guys once. It's worth it. We loved it!! We had a fantastic time! And we enjoyed playing Ludo too - great touch! Can't think of a thing to improve on! Maybe print out your list of 'what to do...'? Otherwise can't think of anything. We had dinner at Ting Tong Kanteen and couldn't fault it, which was thanks to your recommendations list on the website (otherwise we never would have seen it)! Thanks for a wonderful weekend! Thanks so much, we had a fantastic time and surprisingly thanks to the rainy weather we were actually forced to completely chill out and relax which is just what we needed! It was perfect! Miss Myrtle was awesome and we could not have chosen a better spot! 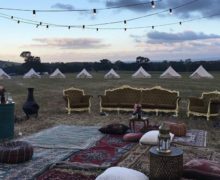 Thanks for the recommendation 🙂 Thanks so much for the great experience, we will definitely be organising another glamping experience with you guys again soon. Thank you so much for everything! 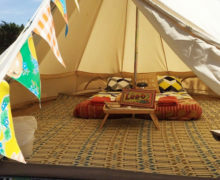 We had a wonderful time and everyone was very impressed with the bell tents and all the inclusions. You guys provided a great service and helped us have a fantastic reunion. Thank you so much! It truly was the BEST weekend of our lives! Thank you so much for your team adding to our dream! Everything was perfect! 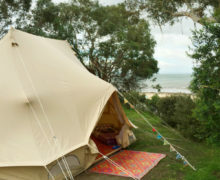 Wish we could have stayed out there longer in your amazing tents! Hi! it was absolutely amazing. Quoted by Jack as the 'best weekend ever!'. Killer surprise and we had such a nice time doing everything at our own pace and exploring such a new area to us both. Thanks again for a beautiful weekend, we'll definitely be back! Thanks team! You did a great job with the tent. Forgot to send a message yesterday, but we had a great time despite some up and down weather. 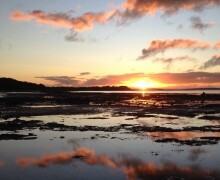 It was a great area at Point Leo, Red Hill and Flinders thaere with beach, wineries, cafes etc. and went down to the hot springs too! 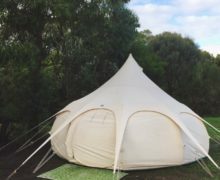 It was a thoroughly enjoyable experience and the tent was great - very spacious and comfortable. 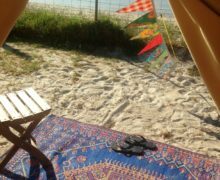 We especially enjoyed the Iluka property which was peaceful and quiet and the entire family had a great experience which we would recommend to any young family. Thanks again for the lovely stay!! 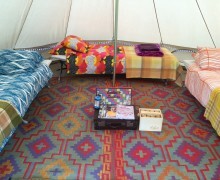 We loved the set up and are definitely looking forward to the next time! 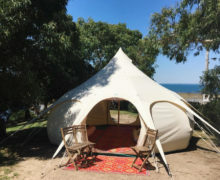 My daughter and her friends had a fantastic time in the gorgeous Emperor tent, it was a unique experience for them all and looked perfect on our property. I posted some pics to my Facebook page and lots of friends asked for your details which I have forwarded on. Hopefully you will get a few new bookings from them down the track!! We look forward to using your services again, next time it will be 'Peggy Sue'. 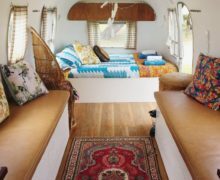 We absolutely loved our glamping experience. The campsite was beautiful and we had it all to ourselves. Your service was great too! 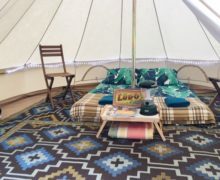 We honestly expected to be freezing cold in the tent [as an unpowered camp area had been chosen] but we weren't, everything was very comfortable. The staff at the campsite were super friendly too. I will definitely be doing this again! Thanks for another fabulous weekend.... We loved every minute!! 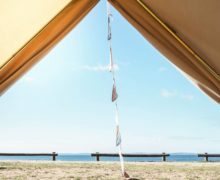 Thank you once again for creating an unforgettable glamping experience for our Quiksilver & Roxy sales team. Everyone had the time of their life. The visual feast on arrival was really quite magical. Pt Leo was the perfect destination for our experience. Everything was just amazing and we can’t thank you enough. Thanks again for an unreal weekend! We had so much fun. 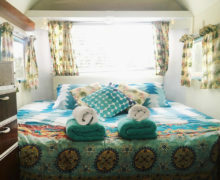 The caravan was amazing so thanks again. 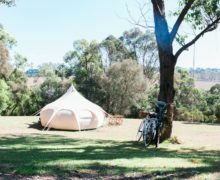 We loved our glamping experience, it was perfect. 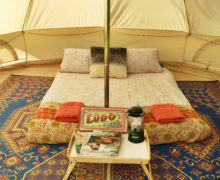 The little heater inside the tent is a great idea and definitely made the experience more comfortable for us as it was so cold. The bed and pillows were very comfortable and having the extra blankets was great too. I loved the fairy lights - a cute touch! Thank you so much! I'll definitely be recommending you guys to my friends and family!! Our stay was perfect and we wouldn't have it any other way!!! 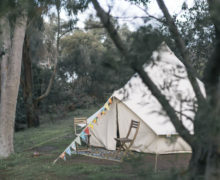 I'm sure we'll be booking with you again for our next camping retreat! 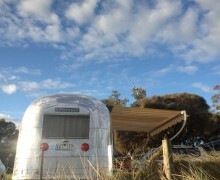 Thanks for an amazing experience, the voucher was a wedding gift and glamping was part of our honeymoon tour. 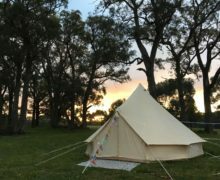 Thank you so much for the wonderful experience of Glamping! 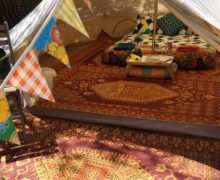 It was fantastic and everyone commented on how amazing the tents looked, the decorations and how comfy it was. Thanks again, hope we can use you again in the future! 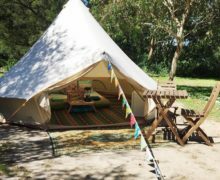 We had a great night away in Point Leo and the Bell Tent was everything I expected. Just wanted to say thanks and that we will be recommending you guys. 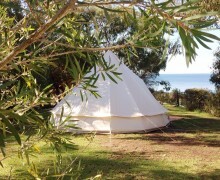 Feedback from Point Leo would be to book site 12 if you want a powered site and ocean views - it was ideal. Oh wow, thank you. I am so impressed with your customer service. 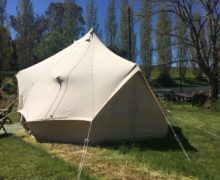 You have not only provided a gorgeous tent but have gone above and beyond in caring for your customer, such great communication and attentive responses. I have highly recommended you on my FB page. 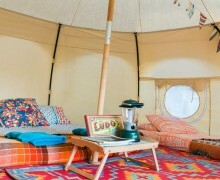 We had a fabulous time 'happy-glamping'! I cannot TELL you how many times I heard comments like: Jess - this is amazing, How good is this, We had the BEST weekend, We need to make this an annual thing.... etc. It was such a positive experience. 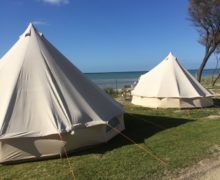 Even our neighbouring campers came to have a peek in the tents and went to collect all their friends to come and have a look. 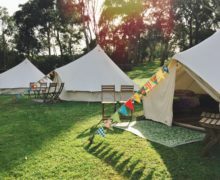 It was such a great time - Tents, beds and bits and bobs included were just perfect. Cannot recommend it more highly - you guys made it so easy to just get there and have no choice but relax! THANK YOU! 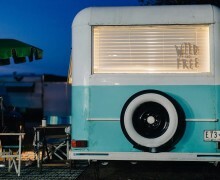 We all just wish you guys facilitated campsites closer to Sydney - the 10hour drive was a hard feat! 🙂 But well worth it! We had an amazing time and also had many compliments from passerby's. 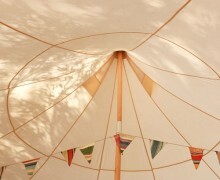 Again, thank-you so much and we will definitely be back again, and maybe next time try a bell tent! What a weekend! Thank you so so much to you and your team for making everything so perfect! It was truely a once in a lifetime (soon to be repeated) event and everyone loved it.